Among the earliest evidences of some creature, either human or at least more manlike than any living ape upon earth, are a number of flints and stones very roughly chipped and shaped so as to be held in the hand. These were probably used as hand axes. These early implements (“Eoliths”) are often so crude and simple that there was for a long time a controversy whether they were to be regarded as natural or artificial productions. The date of the earliest of them is put by geologists as Pliocene — that is to say, before the First Glacial Age. They occur also throughout the First Interglacial period. We know of no bones or other remains in Europe or America of the quasi-human beings of half a million years ago, who made and used these implements. They used them to hammer with, perhaps they used them to fight with, and perhaps they used bits of wood for similar purposes. The face, jaws, and teeth are mere guesswork (see text). The creature may have been much less human-looking than this. But at Trinil, in Java, in strata which are said to correspond either to the later Pliocene or to the American and European First Ice Age, there have been found some scattered bones of a creature, such as the makers of these early implements may have been. The top of a skull, some teeth, and a thigh-bone have been found. The skull shows a brain-case about half-way in size between that of the chimpanzee and man, but the thigh-bone is that of a creature as well adapted to standing and running as a man, and as free, therefore, to use its hands. The creature was not a man, nor was it an arboreal ape like the chimpanzee. It was a walking ape. 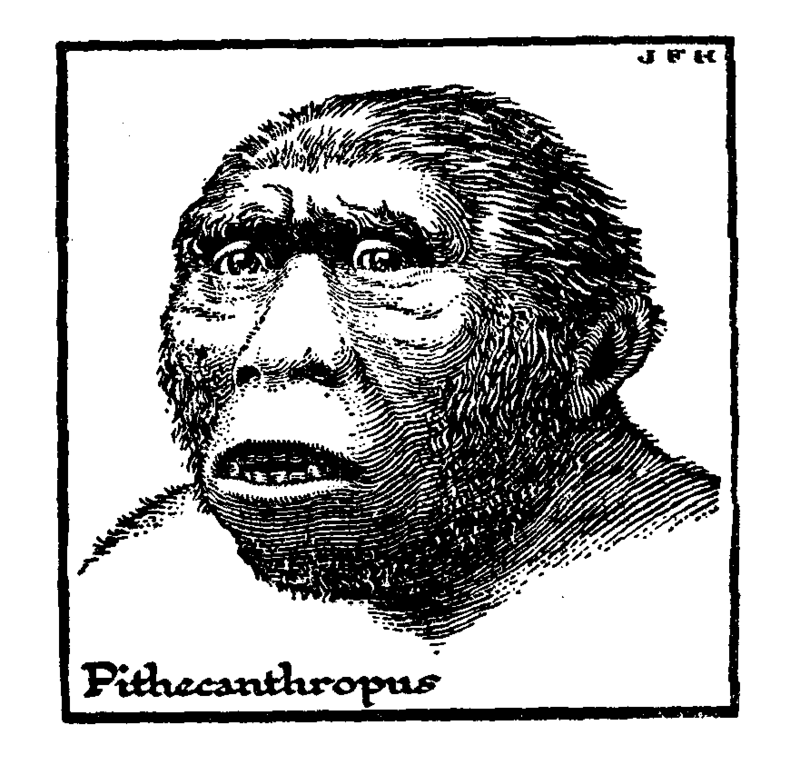 It has been named by naturalists Pithecanthropus erectus (the walking ape-man). We cannot say that it is a direct human ancestor, but we may guess that the creatures who scattered these first stone tools over the world must have been closely similar and kindred, and that our ancestor was a beast of like kind. This little trayful of bony fragments from Trinil is, at present, apart from stone implements, the oldest relic of early humanity, or of the close blood relations of early humanity, that is known. While these early men or ?sub-men? were running about Europe four or five hundred thousand years ago, there were mammoths, rhinoceroses, a huge hippopotamus, a giant beaver, and a bison and wild cattle in their world. There were also wild horses, and the sabre-toothed tiger still abounded. There are no traces of lions or true tigers at that time in Europe, but there were bears, otters, wolves, and a wild boar, it may be that the early sub-man sometimes played jackal to the sabre-toothed tiger, and finished up the bodies on which the latter had gorged itself. Some writers suppose that a Wood and Shell Age preceded the earliest Stone Age. South Sea Islanders, Negroes, and Bushmen still make use of wood and the sharp-edged shells of land and water molluscs as implements.